~Craig Morgan, song "A Little Bit of Life"
I am just back from my visit to see your nephew Jordan, aka Assistant Captain of the Plumas National Forest, Engine 22 United States Forest Service. Crikey…that is one long title. His other handle is Flash. Remember a few years back when he told Maddie that his middle name was Danger, and she believed him? Well, this time he told a woman who wanted his name for an award that his name was Flash, so he has a certificate awarded to Flash Townsend hanging over his desk. Too funny! I thought you all would be anxious for the updates about our Jordy, and how I fared on my weekend trip to see him in his mountain home of Greenville. So here's the lowdown on our firefightin' mountain man. Two views of the Feather River. The area is also accented with photogenic suspension and trestle bridges. I longed to stop and take photo after photo, but the road is narrow, and unfortunately doesn't provide for many safe places to pull over and shoot your heart out. Greenville is a historic and quaint town of 2,000 residents that is perched at about 4,000 feet in elevation. It is situated in the stunning Plumas County in a valley surrounded by snow covered mountains for most of the year. Lakes, conifers and logging roads abound. Jordan, as you both know, fell in love with the area when he became a Plumas Hotshot over ten years ago now. I was excited to see the house that he purchased and has spent the last year renovating. I found Jordan's house easy enough, it is on Main Street after all, but Señor Captain was nowhere to be found. However, his dogs, Emma and Jake were home, and I thought that they might bust through the large living room window trying to get at me. Having had to pee for several hours, I really would have liked to go into the house, but with the ferocious fangs flying inside I had no choice but to retreat to my car and watch little snow flurries start to come down. So much for being a little early. Jordan surprised me by walking up on foot about 30 minutes later, just when I was sure that I was starting to reabsorb my "water". Little did I know that he had been just a few steps down the street hanging at the local saloon called The Way Station. So much for neither of us having cell phones. Jordan introduced me to Emma and Jake. Emma is a beautiful lab and pit bull mixed breed that Jordan rescued from the Chico Humane Society about 3 years ago. She is a sweetie. Jake is Jordan's newest canine addition to the family. He is a Catahoula hound, and he is an adorable little terror. Still in the puppy phase, he has proved hard to house break, and he still likes to chew on everything. Jordan informed me that the firefighters had all been "furloughed" that day due to the budget crisis in Washington. His boss had told him to go home at noon until further notice. (The federal funding came through over the weekend, as we all know by now, a government shutdown was narrowly avoided, and he was back to work on Monday), but taking this turn of events in stride, Jordan had headed to the local saloon with friends to have some drinks, await the decision of the fates and the arrival of his mother. After showing me around his home sweet home, Jordan suggested that we go have cocktails at the bar just down the street (well I had a cocktail...he had a "man-drink") where he could introduce me to his friends. I think I was the first person in a very long while (perhaps ever), to order a Cosmo in The Way Station. My ordering of this cocktail caused Jordan no end of amusement. My furloughed firefighter had been sipping whiskey since the early hours of the afternoon, but as it turns out, Mary, the bartender makes a mean Cosmo, and all was well in my world. Emma and Jake are out in front of the truck for their morning constitutional. The next morning Jordan showed me how he runs his dogs... Greenville-style. While I, with some difficulty, hoisted myself into Jordan's very tall truck, he loaded Jake and Emma into the back seat. Then with Craig Morgan playing on the radio we took off on Highway 89 for a local logging road. At the base of Old Haun Road, Jordan let the dogs out to run free alongside the truck. They knew the drill, because they took off at breakneck speed up the road, stopping only to take a roll in the snow, drink from pools along the roadside or to cavort among the trees. It is certainly a dog's life in Greenville. Grillmaster Steve working his magic on Tri Tip. 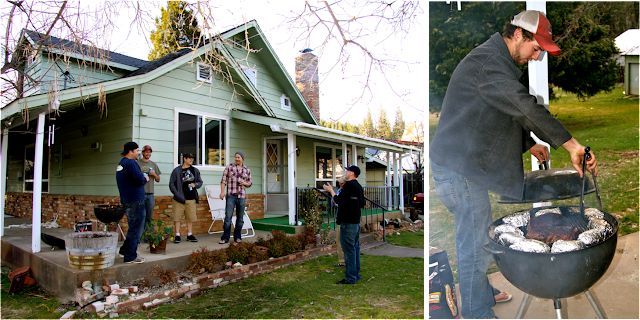 On Saturday afternoon, Jordan and I hosted a group of his friends and work buddies over for a grilled tri-tip and sturgeon dinner. I had packed an ice chest full of goodies for Jordan from Whole Foods. I brought lots of meat for his freezer, and my co-worker William had given me a beautiful piece of sturgeon that he had caught earlier in the week in the Sacramento Delta which I had frozen for the occasion. Jordan assured me that my grilling skills (which I consider to be more than adequate, as you know) would not be needed because his friend Steve, aka Grillmaster, was coming over to take care of the playing-with-fire duties. Jordan built a huge blaze in his fireplace, again…Greenville-style, using a drip can with a mixture of diesel and gasoline. No kindling needed in this neck of the woods. When the fire was nice and hot, I placed foil-wrapped potatoes and loaves of garlic bread along the perimeter of the fire, so they could slowly cook while I put out appetizers and made a big batch of margaritas in a plastic bucket that had once contained cookies from the Solvang Bakery. Note to self...Jordan could use a pitcher. The herbed chèvre and flat breads were a big hit with his friends, but the olive tapenade that I brought was pronounced "too salty", and was barely touched. Once I had chili heating in the crock pot, all I had left to do was sip margaritas, and photograph Jordan and friends to my heart's content. Grillmaster Steve was indeed very adept, and the tri tip and sturgeon were cooked to perfection. What a feast we had! Tuck in to a hearty breakfast at Anna's Cafe. Monday morning came too soon, and it was time for me to head back to Guerneville and for Jordan to return to work. We took the dogs for a last “run”, before I kissed Jordan goodbye. I stopped at Anna’s Café for a hearty hot breakfast on my way out of town. Michelle, I am hoping that you and Maddie can come out for a trip to the mountains this summer. Of course it would be wonderful if we could tear Hoolietta away from the Guadalupe Baking Company for a few days, but I won’t hold my breath. Jordan sends his love to you both, as do I. Baby back ribs are my favorite ribs for grilling. Michelle and I experimented with St. Louis Ribs when she was here, and we didn't like them nearly as much. Baby backs are more money, but if you are going to spend an entire afternoon braising and then grilling, you may as well spend a little extra and have rib perfection. I always use purchased BBQ Sauce because I can get great pre-made ones at Whole Foods. I really like Daddy Sam's or Everett and Jones, which is a local product for me. Feel free to make your own best sauce, or jazz up an average store-bought sauce, as I saw Grillmaster Steve do in Greenville, with hot sauce, honey, lime and herbs. This technique allows for great results without the use of a smoker, and the finished product are ribs that are literally "fallin' off the bone", something which I have found many folks claim about their ribs, but do not actually achieve (you know who you are). Store-bought (see intro above for recommendations), or this family recipe from chef extraordinaire Rick Bayless is excellent and quite easy. Rick's folks owned a barbecue joint called the Hickory House in Oklahoma City that had a good run for nearly 40 years before closing its doors in 1986 under new management. The history of the restaurant and recipes were featured in Saveur magazine. 1. 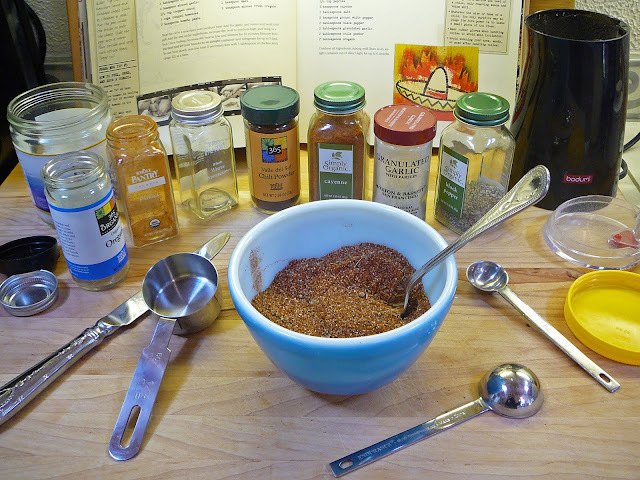 To make the spice mix: Combine first 8 ingredients together in a small bowl, mixing well. Makes about 1/2 cup. Leftover spice can be kept in a tightly sealed jar for a couple months. 2. To make the barbecue sauce: Combine all the ingredients in a saucepan and simmer over medium-low to low heat, as required to maintain a gentle simmer for 30 minutes. Cool, then store in a tightly sealed jar in the refrigerator for up to one month. Makes about 3 cups. 3. To prep the ribs: Start with one large half sheet pan. Tear off two long pieces of foil and lay them on top of the sheet pan so that they overlap by several inches on the sides, and are long enough to wrap the ends back around to the top. Lay two racks of baby back ribs on the sheet with the meaty side up. 4. Sprinkle dry rub on each rack and rub well being careful not to tear the foil. Then seal up the foil around the racks in a loose envelope that is completely sealed (this allows the ribs to braise in the seasoned juice). Bake in a 280 degree oven for about 2.5 hours. No need to turn or do anything else. Easy! 5. Finishing the ribs on the grill: Steve's recommendation goes for me as well, when it comes to finally putting the ribs on the grill. The ribs should be very tender at the end of the cooking time in the oven. 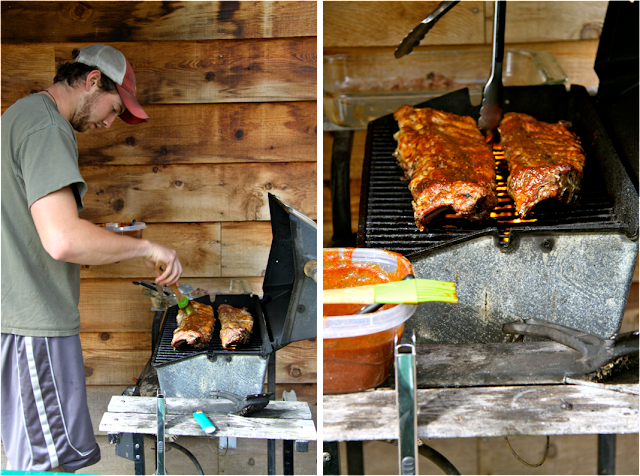 You will need to use care in transferring the ribs to the grill, so that the racks stay intact and do not pull apart. Do not uncover the ribs until they are ready to go on the grill (unless you are cooling and refrigerating overnight - see note below). I like to use my charcoal grill for this, because it adds flavor. When you are ready, pour the accumulated fat and juices off the sheet pan. I lightly brush the backside of the racks with sauce, and then place that side down on a hot grill first, but not directly over the fire. Indirect heat is best.Total cooking time will be roughly 10 minutes, just enough to apply two to three layers of sauce to each side, and to brown up the ribs and thicken the sauce. Remove from the grill when satisfied with the results. The ribs are delicious served with loaded baked potatoes or Our Family's Potato Salad, or Grandma's Best Macaroni Salad or Coleslaw - so many options. 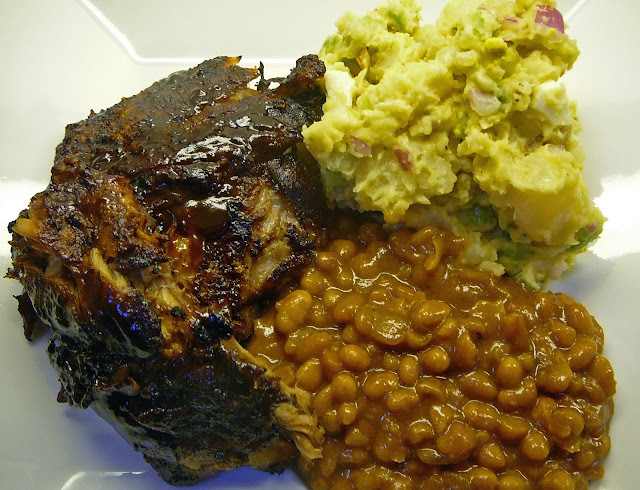 Ranch beans or baked beans and garlic bread are nice additions to the plate. To wash it all down, the standards work here: a hearty red wine, beer or our favorite margaritas. P.S. The ribs can be braised the day before, cooled and stored in the refrigerator overnight. The next day, let the ribs sit out at room temperature for about 60 minutes until ready to throw on the grill. Another enjoyable read and peek into your family. Trying to cut down on meat, but when you want it, you want it. Have you read The Dirty Life..superb book and a MUST read. (a city girl's sojourn into organic farming via falling love) I followed that with Medium Raw by Bourdain.